With the July 4th holiday weekend coming up and plenty of summer outdoor entertaining in general, I've been thinking a lot about what desserts to serve. After a meal of grilled meat and starchy sides there's not usually much room left for a heavy cake. And the hot weather begs for something cool. So I find myself scooping out dishes of ice cream but wanting to somehow make it more special. Häagen-Dazs and, as I kept dipping my spoon into each flavor over and over, I was thinking that I should serve them all and let everybody choose which one they wanted. And that's when the light bulb went on over my head. 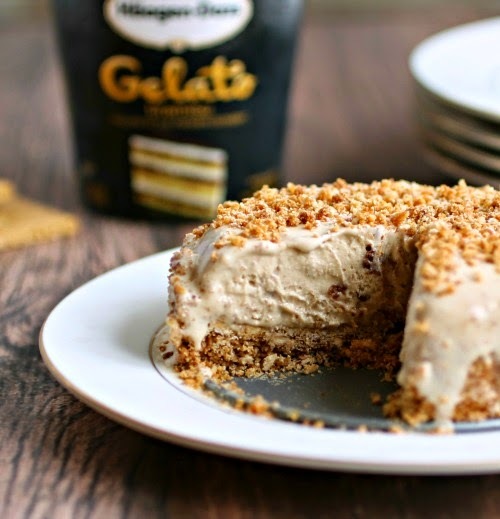 I'm obsessed with the combination of salty and sweet so why not make a salty and sweet crust as a base for the gelato. And then I thought I should even go one better and add some salty and sweet crunch right into the gelato. I couldn't wait to try out my idea and it turned out even better than I'd hoped. I used half sized spring-form pans so that I could create a "cake" for each flavor of gelato. They can be made ahead and kept in the freezer until the party and guests can choose a large slice of one flavor or smaller slices of all flavors. Or large slices of all flavors! Whatever works... Enjoy! Combine the graham crackers and pretzels in the bowl of a food processor and pulse until crushed. Pour in the melted butter and continue pulsing until all the crumbs are coated. Press the crumbs into the bottom and halfway up the sides of a 4" spring-form pan. You should have a couple of tablespoons left over. Spread the leftover mixture on a baking sheet lined with parchment paper and place the filled pan next to it. Bake in a pre-heated 400 degree oven for 10 minutes. Allow to cool completely. Remove gelato from the freezer and allow to sit at room temperature for 5 - 10 minutes until slightly softened. Scoop into a bowl and gently fold in the loose baked crumbs. Add the mixed gelato to the baked crust, top with a few more crumbs and freeze for a few hours or overnight. When ready to unmold, run a sharp knife under very hot water for a few minutes and gently run it along the sides of the spring-form pan. Repeat until you've loosened the whole thing and then open the mold. The cake should pop right out. Return to the freezer until ready to serve. Note that I doubled the recipe and made two cakes at the same time but you could also triple or quadruple it to make them all. 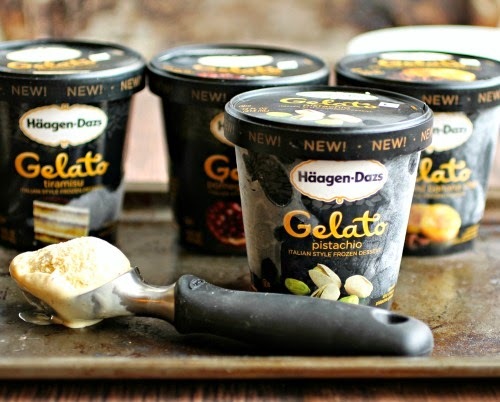 New Häagen-Dazs gelato flavors are Caramelized Banana Chip, Pistachio, Tiramisu and Pomegranate Swirl. Disclosure: I was compensated for creating this recipe but my opinions are my own. Thank you for supporting the products I love and use in my kitchen. Absolutely sinful and I love it! I adore you and your need to add "crunch" to everything! This sweet n salty combo is too good for words combined with the gelato!! This looks amazing! It is so hot right now. I want some of this for breakfast, lunch and dinner! Hell yes ice cream cake!! 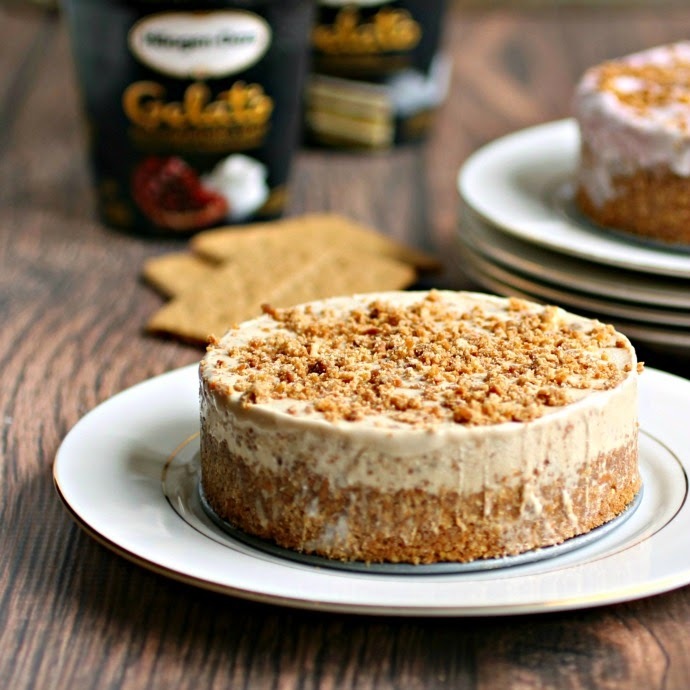 Err gelato cake. Think I'd go for the banana one first. Lol I love BecHeflin's comment and I totally echo her sentiments: the drool is preventing me from forming words. 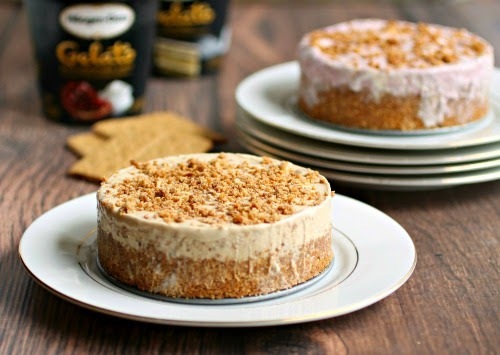 I need these gorgeous, salty sweet, crunchy creamy gelato cakes in my life like, yesterday. Fabulous job, Anita, and I'm dying over your gorgeous photos.